Making safety and security simple. AARC Systems designs, develops and deploys innovative solutions to simplify the setup and management of safety and security across a diverse range of applications. EVACUATION is generally triggered to be site wide, however, with the AARC EVAC system, zoned evacuation can be easily set up if you have a larger worksite or campus. The evacuation procedures may vary in different locations of the facility. AARC EVAC can give customised instructions according to the location and exit strategy. In some workplaces, it may be appropriate to give these instructions in multiple languages. DURESS can play coded messages like “call for Mister Black on line three”. This has several combined advantages; the covert broadcast minimises the risk of the threat escalating; if the perpetrator believes that a small business with minimal staff may be an easy target, there appears to be evidence that there is someone else making a PA announcement and there is also a Mister Black; the main advantage, however, is that anyone at the facility that is trained about the covert code will be made aware of the potential threat to the front of office staff and can attend promptly to assist. 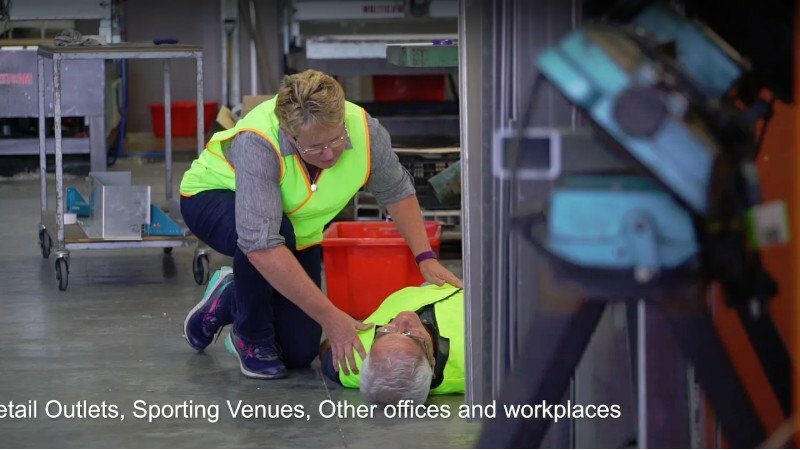 FIRST AID ASSIST can be zoned so that onsite first responders are directed straight to the emergency. Single or multi-button alert panels can be installed throughout the business and each First Aid Assist button is coded to its location. A custom message for that location is triggered across the networked of receivers in a system so that any designated first aider is alerted and knows immediately where the incident is. The result is improved First Aid response times to accidents, injuries and other health related matters, leading to better outcomes. LOCKDOWN can mean different things to different organisations. School LOCKDOWN procedures may involve not playing any sirens or lockdown messages, but instead, a covert alert such as a designated piece of music may be played over the system. From their previous lockdown training drills, upon hearing that particular piece of music, staff and students would be aware that a school lockdown has been activated and therefore they need to follow their trained lockdown procedures. A factory that has hazardous materials onsite may have LOCKDOWN procedures that require staff and visitors to remain indoors until the site is clear of the emergency. In this case, it would be appropriate to first play an alert siren followed by a voice message that gives clear, verbal LOCKDOWN instructions. In some workplaces, it may be appropriate to give these instructions in multiple languages. Call AARC Systems on (03) 5334 2865 or use the contact form to inquire about our innovative Emergency Alert solutions.